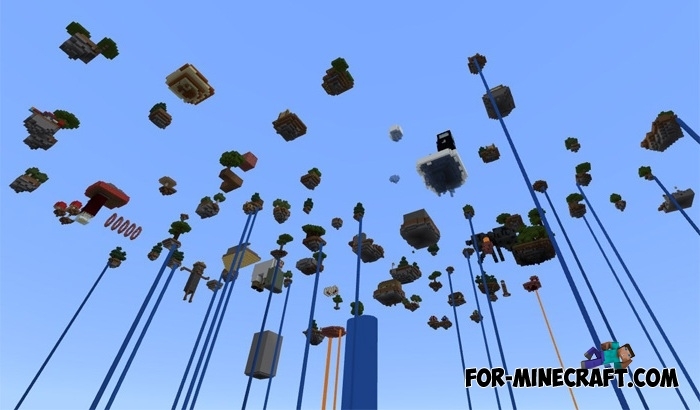 In fact, this map is related to floating islands, the main task is the complicated survival. The difficulty is that the islands are at a remote distance from each other and are not connected by bridges, so you also need to collect resources and build other than survival. Creative Survival is not a natural island, basically you will see structures built by thecreator's imagination. Also, the map has the ultimate goal of building a wool sculpture, but the wool blocks are everywhere so you need to reach all the islands in any case. Choose one of the islands for the base and plan how to get to the next islands. In the end, you must visit all the islands, collect all the wool and complete the sculpture. Only by doing this, the map can be considered complete.